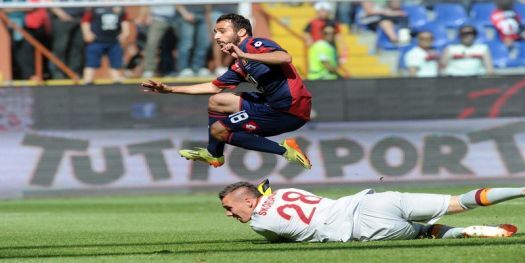 Genoa has ended the 7th season in a row in Serie A with a 4-2 defeat against Sassuolo (goals of Calaiò and Gilardino, his 15th) and a 1-0 victory against A.S. Roma at Marassi with a goal of Fetfatzidis (see fotos). We reached a total of 44 points and the 14th position of the standings. Not a very remarkably season of our Griffins with only a few highlights: victories against Sampdoria (0-3) & Inter (1-0), the return of Gasperini and the “born” of the youngsters Mattia Perin and Stefano Sturaro in Serie A. This summer 3 Genoa-players are active at the Worldcup in Brasil: Mattia Perin (Italy, but National coach Prandelli forgot Gilardino), Sime Vrsaljko (Croatia) and Ioannis Fetfatzidis (Greece). We wish them a lot of succes and hope that all 3 stay with us next season.